Trip almost full. Please contact Jarek to check last minute openings. 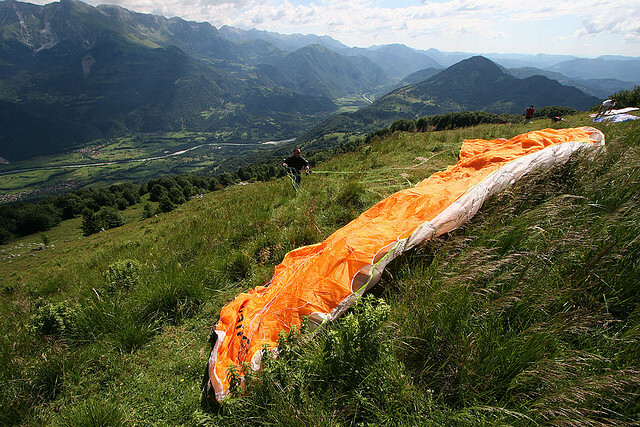 This trip has been unquestionably our most popular European paragliding tour in the Alps. 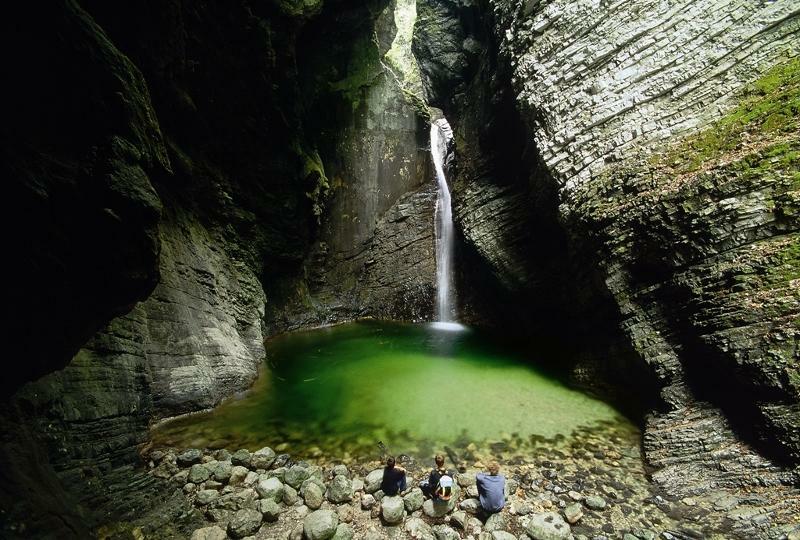 Slovenia is a hidden treasure of the Alps. Consistent conditions make it flyers paradise. 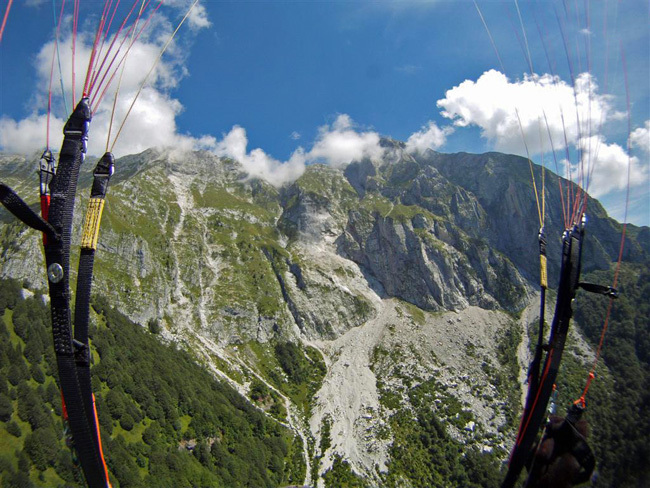 With Slovenia 2019 trip we are well into the second decade of Antofaya Expeditions' operations as a paragliding tour organizer. You can count on our experience. 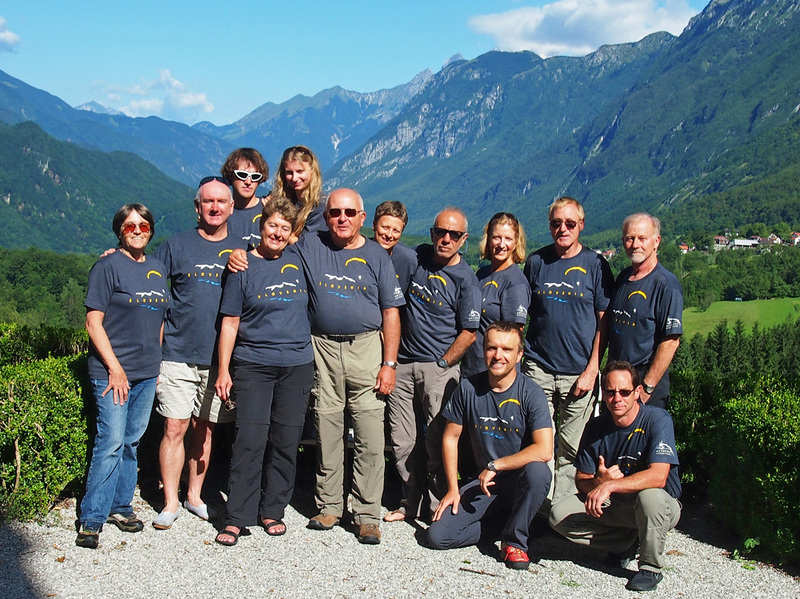 Past years (2012 to 2018) our groups of pilots had so much flying fun in Slovenia that we are going back to European Alps for more great XC flying. Some participants made their personal distance records, there were some +100km out and return flights, we crossed international borders in the air, we visited various XC flying sites, and everybody had plenty of Italian pizza. And to see how our previous trips looked like please see the photos from the trips or better yet read one of our participant story. Note: This trip is back-to-back with our XC Camp. For pilots participating in both trips we provide free transportation between the trips' locations. 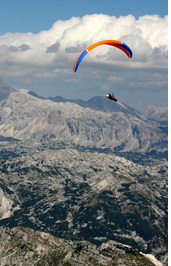 Have you ever looked at the results of Paragliding World Cup or World Championships and wondered: Slovenia? Where is it? Where do those champions come from? 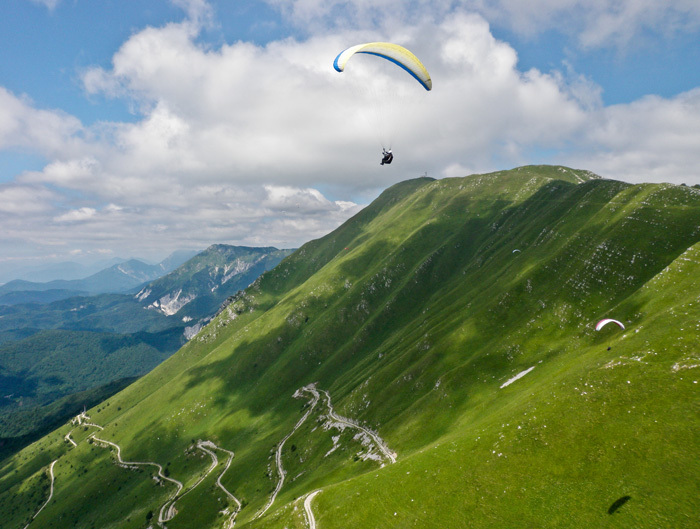 Located at the south-eastern end of the European Alps this tiny mountain country was created for paragliding, for awe-inspiring paragliding. 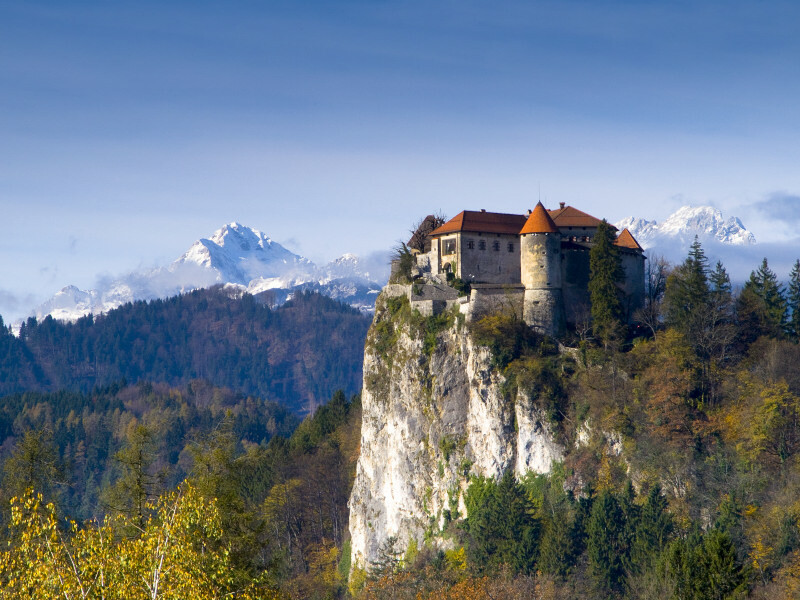 Dramatic Slovenian Alps are one of the most fascinating mountain massifs in Europe with unparalleled beauty of the landscape, wild corners, rugged silver colored mountains and valleys filled with green meadows. Where else while thermaling over a snowy peak can you see Mediterranean sea? Where else can you cross international borders while flying? Where else can you jump from one alpine valley to another on an XC flight following an emerald river below? 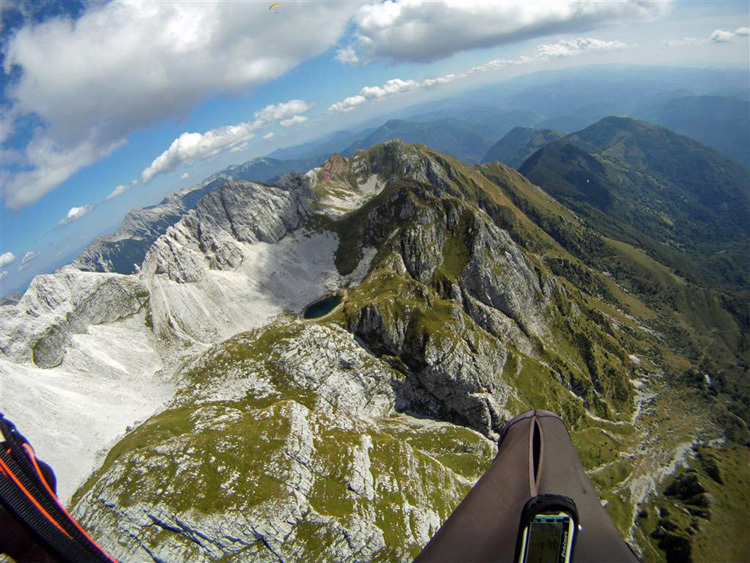 Cross country flying in Slovenia inspires. 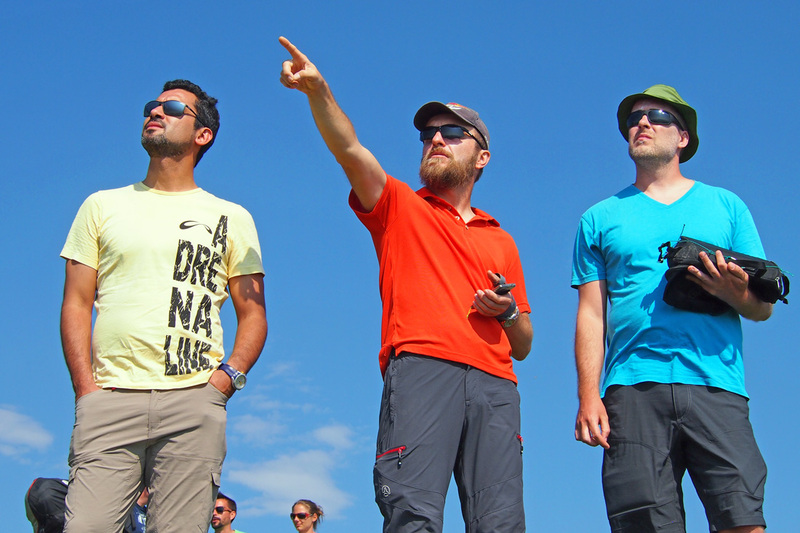 Antofaya Expeditions and a cross country mentor Jarek Wieczorek with help of local European guides invite pilots of all levels for a paragliding trip to Slovenian Alps, one of Europe's premiere cross country flying locations. 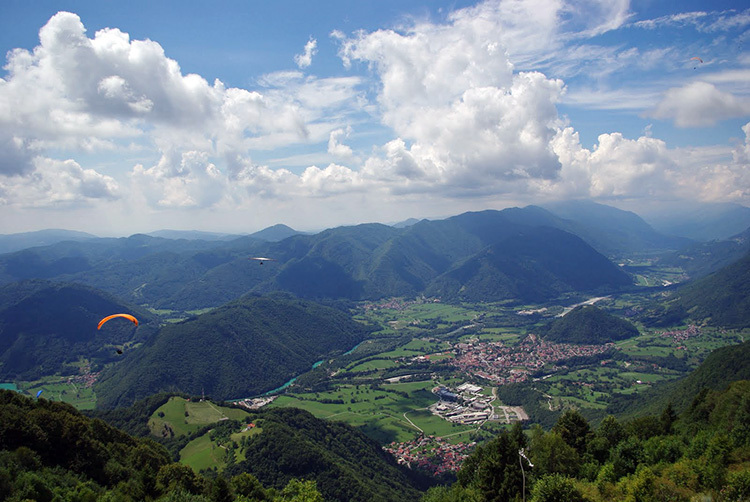 We will be based in Soca valley - a perfect area for both aspiring and seasoned XC pilots. 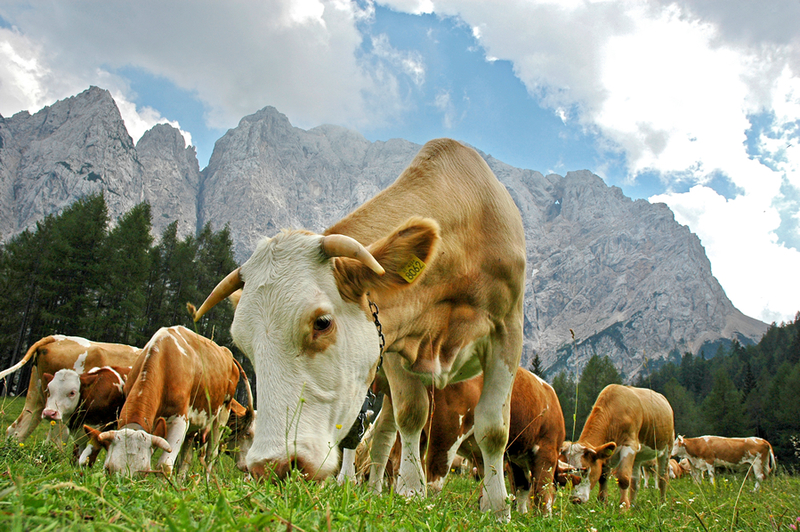 The valley is surrounded by steep ranges of wild silver limestone Julian Alps. 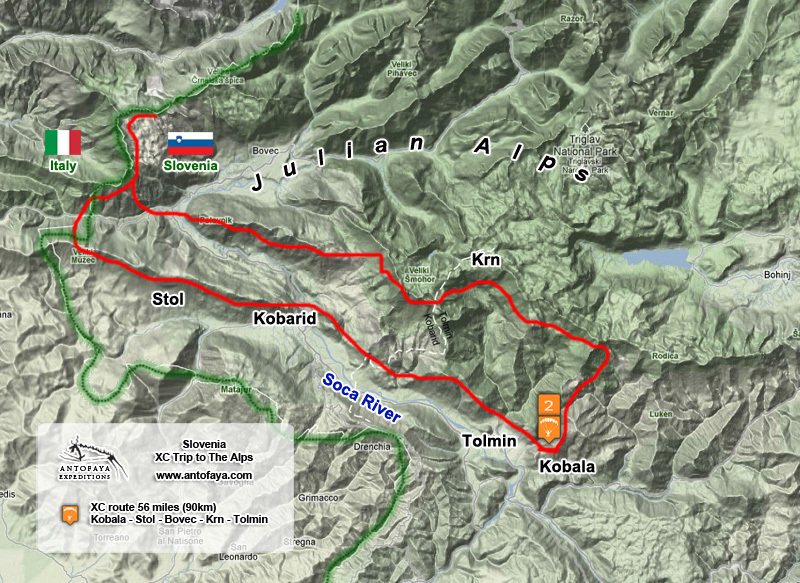 We will try to get every participant to fly along the famous XC route - Kobarid to Italy. 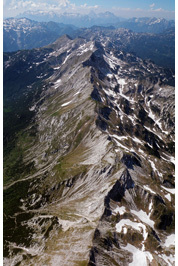 It is a 60 miles (100km) flight lined with thermals and wild peaks. 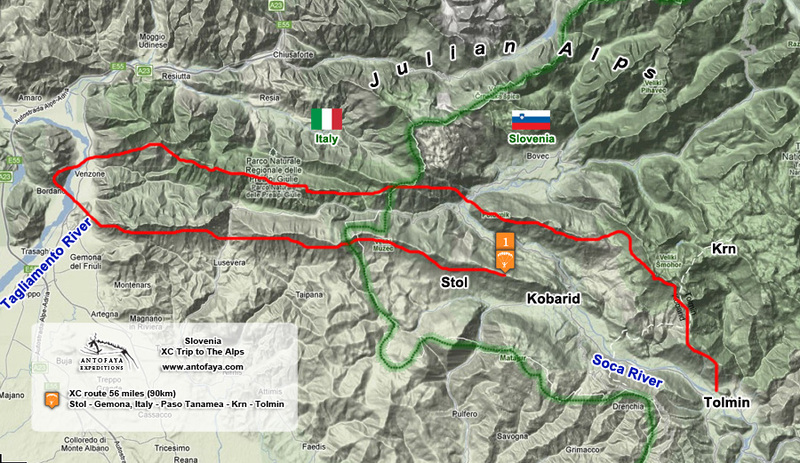 The world champion Valic brothers set their record along the same route. Nevertheless we will not limit ourselves to this one valley only, but travel every day to a flying location with the very best weather. Most of the surrounded area is covered by Triglav National Park with Slovenia's highest peak Mount Triglav at almost 10,000 feet (3000m) easily visible from the air. The starting and finishing point of our adventure will be the international airport of Venice, Italy located just a couple of hours by car from our base in the Slovenian Alps. 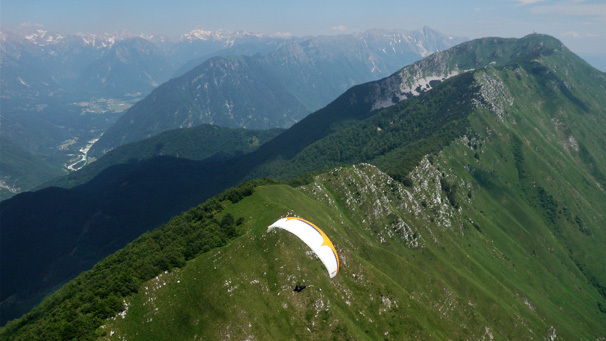 Slovenia being farther south than other parts of the Alps sports warmer and drier climate with significantly more flyable days than other parts of the Alps. It is one of the most reliable XC flying areas in Europe and we will use it to log as many hours in the air as possible. In spring and summer thermals are abundant and well marked with cumulus cloud streets along mountain ranges. 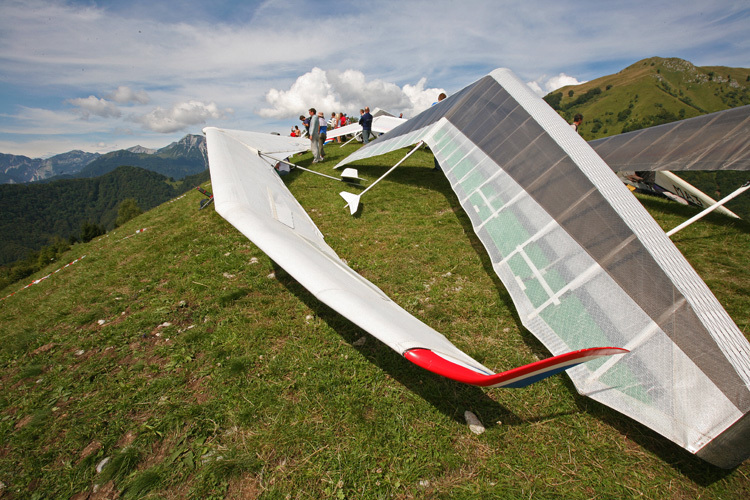 Cloudbase average altitude is between 6,500 and 10,000 feet (2000 and 3000m). 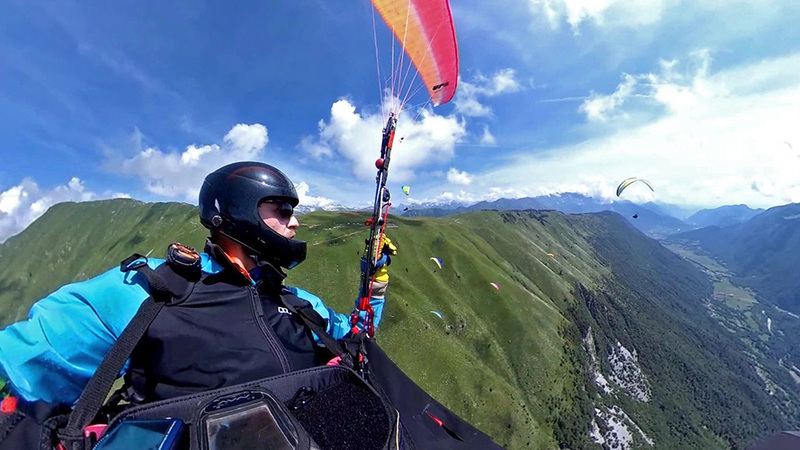 The system of parallel alpine valleys offers lots of landing options and a network of scenic roads between villages enables painless retrieves from XC out-landings. 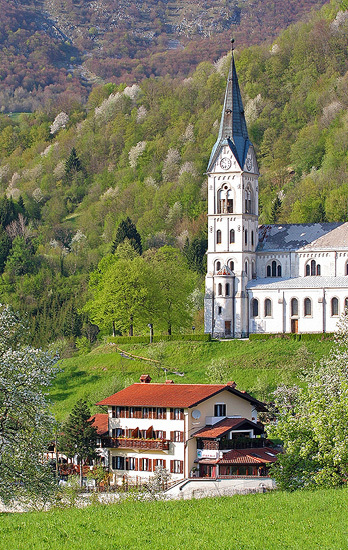 Kobarid and Tolmin villages with their white and brown houses and churches are the centers of the valley. Meandering trough the valley the crystal-clear Soca river and its emerald waters provide stunning contrast to green meadows. Cross country flying in Slovenia is not only about distance and technique, it is also about unforgettable visual experience. Join us! With a large selection of flying sites in and around Soca valley we choose the day's flying locations depending on the weather, pilots' skills and wishes. There are two dozens launches in the aera of our base. We will use Stol and Kobala as our primary XC launches. 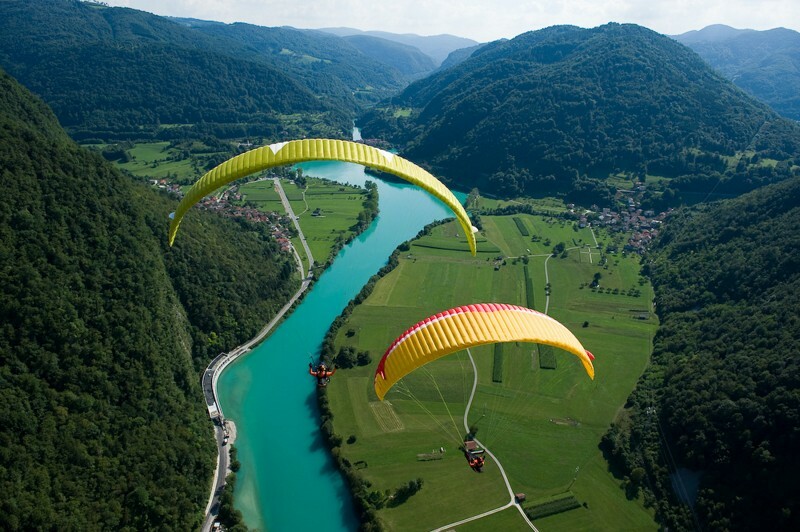 World renowned paragliding site which hosted various Paragliding World Cup events. 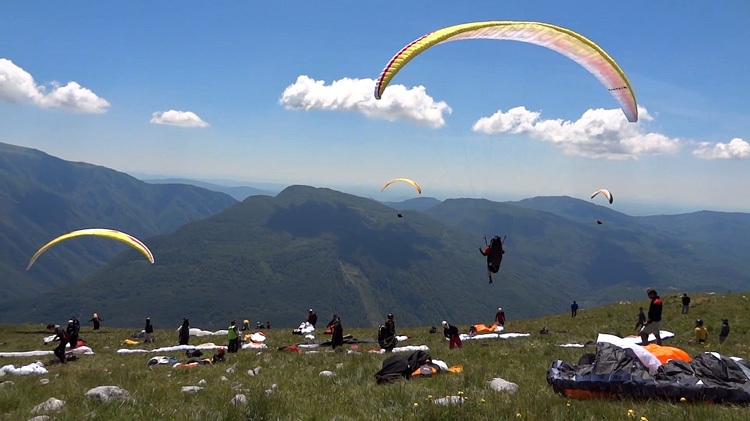 The takeoff is located on a 20 mile(30km) ridge and offers a huge, grassy launch and plenty of opportunity for large number of pilots to spread along the ridge. Thermals start here earlier than at the other sites which gives you an early start for those long XC flights. 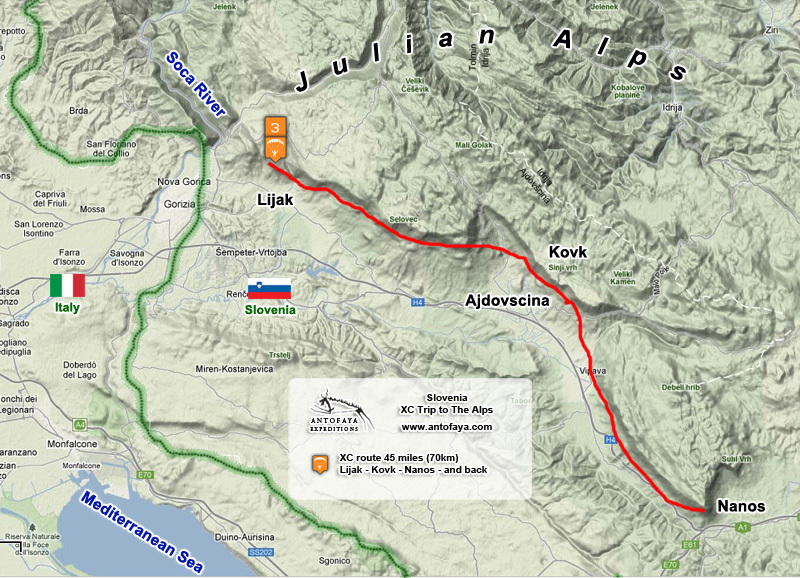 The classic XC route from Stol takes you along the ridge to Italy where you can cross to parallel valley and come back toward Kobarid and farther to Tolmin village along rugged spines of snow covered Krn range. 60 miles (100km) flights are common on any given day. Takeoff access is via a winding gravel mountain road. 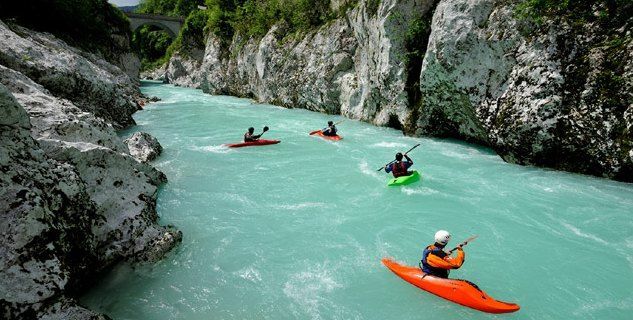 Located at the far end of the Soca valley. 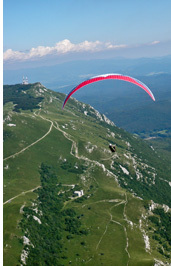 It sports large, grassy launch and is popular between international crowd of both paragliding and hang gliding pilots. Launching is possible in almost any direction which makes this site perfect for variety of conditions. 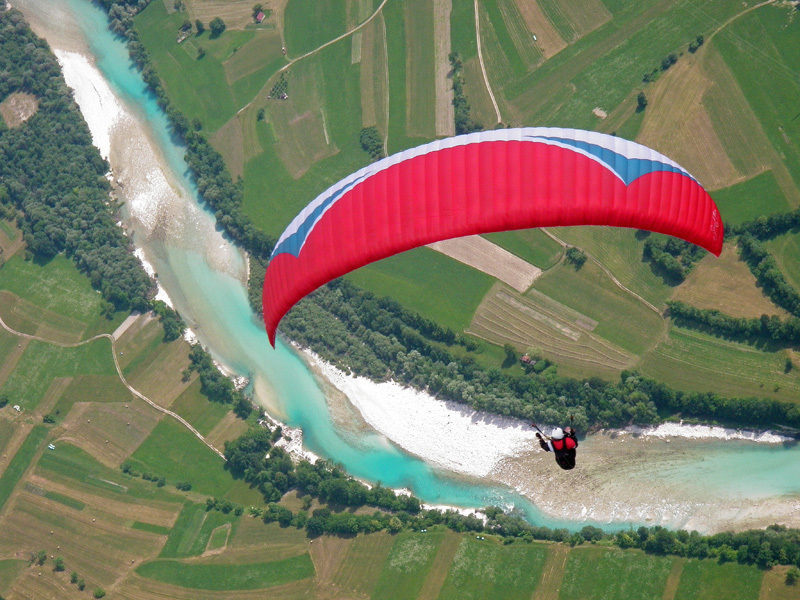 It offers XC flying along the valley of emerald Soca river. 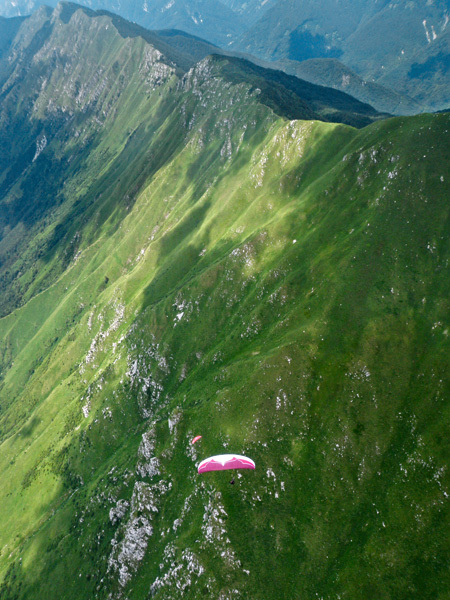 Cross country flights toward Kobarid and Stol are easy for out and return of 25 miles (40km) for beginner XC pilots. Experienced pilots can continue toward Italy and fly deeper into various alpine valleys for spectacular high mountains experience. 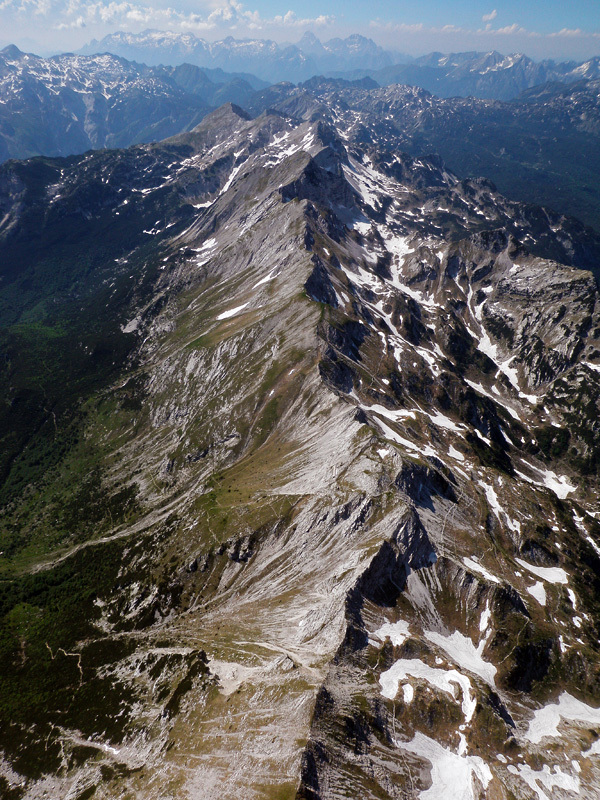 This site is situated at the frontal range of the Julian Alps which allows it to experience Mediterranean climate and often is flyable if deep mountain sites are overdeveloped. The takeoff faces large plains covered with vineyards and picturesque villages with tiny churches and houses of light brown roof-tiles. Flying along the ridge in setting sun allows a XC flights for even a beginner pilot while more advanced pilots can easily fly 45 miles (70km) or more. This site often experience buoyant evening glas-off conditions. Cross Country site with enormous potential. 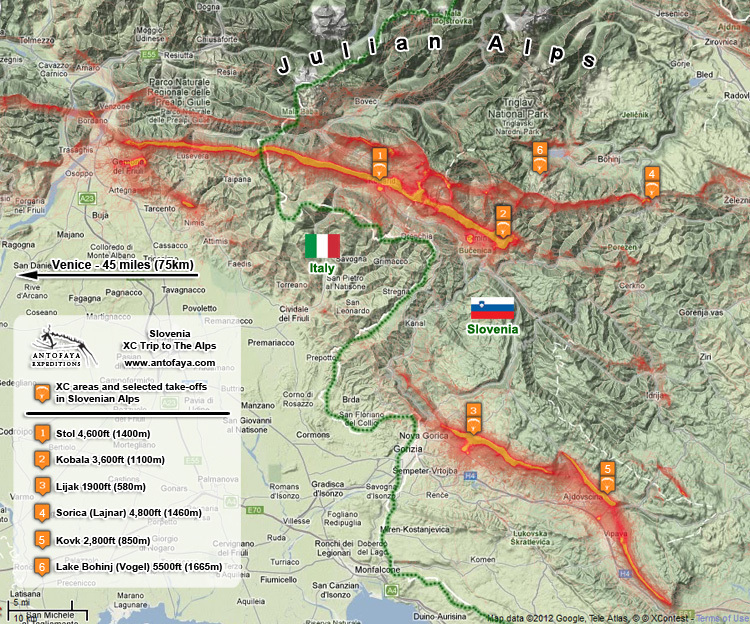 This is where the longest flights of over 120 miles (200km) in Julian Alps has been made. Every day we will check weather conditions if they are good for taking off from Sorica. If yes, prepare yourself for a large distance flight. Beautiful and easy flying site located at the frontal range. Perfect for evening soaring during a glass-off. Inspiring views and options for relaxing evening XC flights. 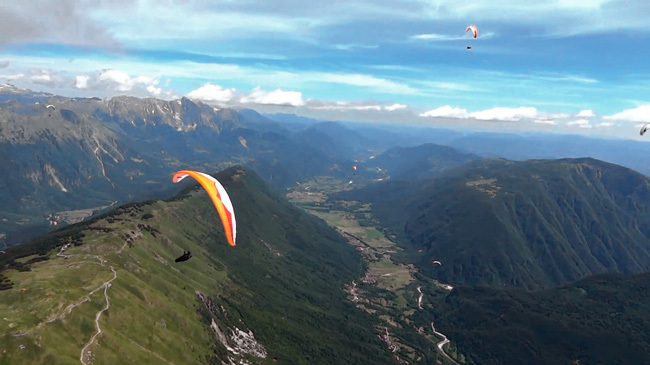 This takeoff is accessible by a cable car running to the top of Vogel mountain at 5500 feet (1665m). The beauty of this site lies in the spectacular vistas across the lake toward the highest peak of Julian Alps - Triglav. 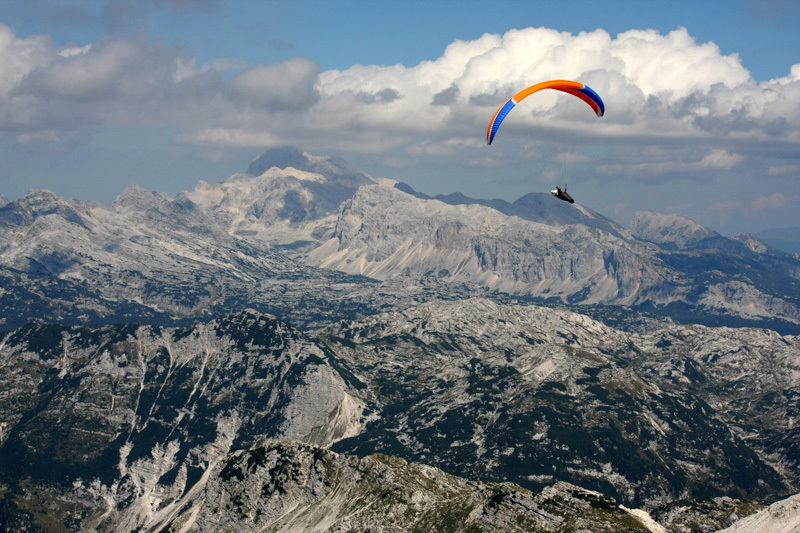 With high cloudbase it is possible to fly deep into the wild terrain and above the spectacular Mount Triglav. If the weather is right and forecasts promising we may head for a day to Austria, to Greifenburg. Greifenburg area is famous for its big XC triangle potential. It is known as the Southern Alps Highway and offers a long and high ridges. 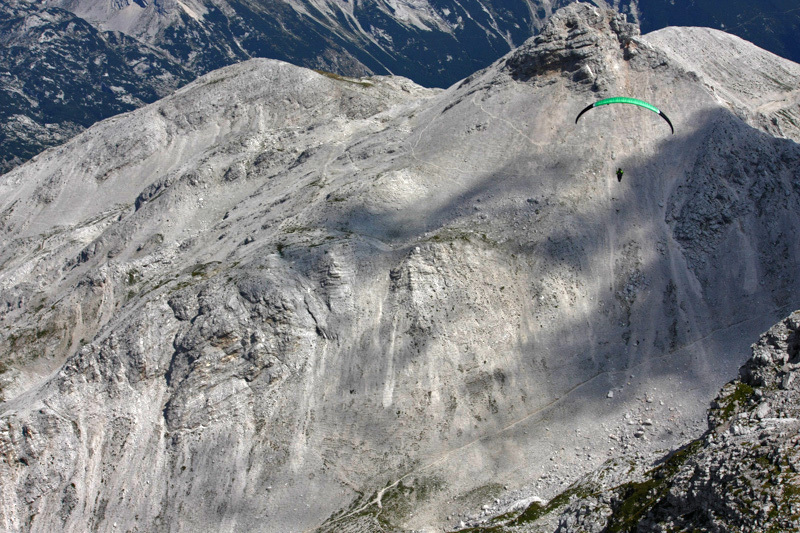 It is high mountain flying with big altitude gains and long glides along wild and remote alpine spines. 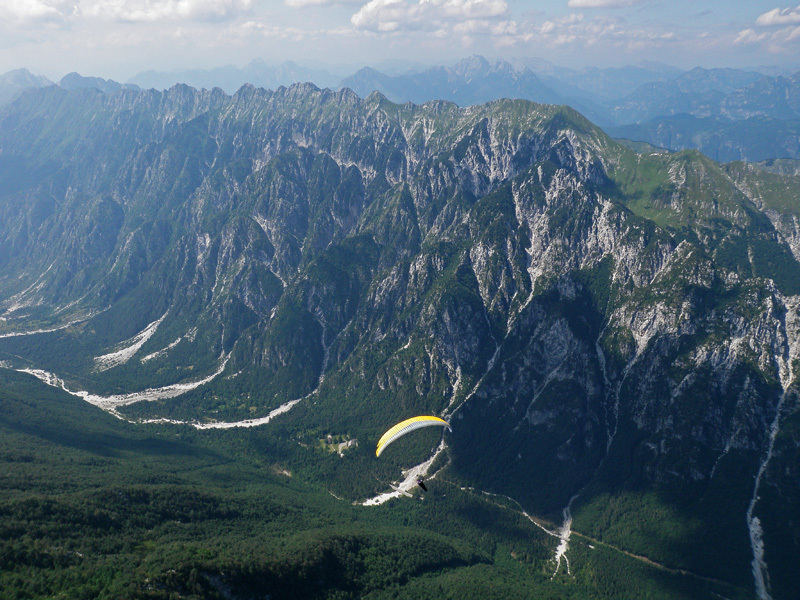 One afternoon we may head to the very high and deep valleys of Mangrat area to fly along impressive high rocky walls of the highest part of the Slovenian Alps. While the area is just too strong for mid-day flying it offers jaw-dropping landscape and sunset flights are very rewarding. At Antofaya Expeditions we always tailor every flying day of your paragliding holidays to your skills and level of experience. The flying sites are suited for pilots who are just starting their XC adventures and equally for experienced competition pilots. Every evening we will analyze the weather forecast and initially decide which launch to use next day. We will plan our XC route using detailed topographical maps and aerial photos paying special attention to difficult valley crossings, landing options, and possible variations of the route. We will discuss each pilot's goals for the coming flying day. This way we will make sure you fly the right site for your experience level. Remember that we are with you to advise, help and mentor. We will explain to you why and how thermals are distributed along the ridges and valleys, where to find them, and how to use them efficiently. Thermaling is the cornerstone of XC flying and we will strive to provide you with all the knowledge you may need. We want you to get the maximum airtime possible and the biggest XC available. In the morning during the hearty breakfast we will confirm our schedule for the day and if necessary make weather related adjustments. Between 9 and 10 we will drive in our vans toward our selected take-off. We will never leave you alone on a launch. One of our guides always launches last. Prior to flying we will always visit LZs and discus landing approaches, the take-off techniques, and available XC routes. You being informed and safe is our priority. 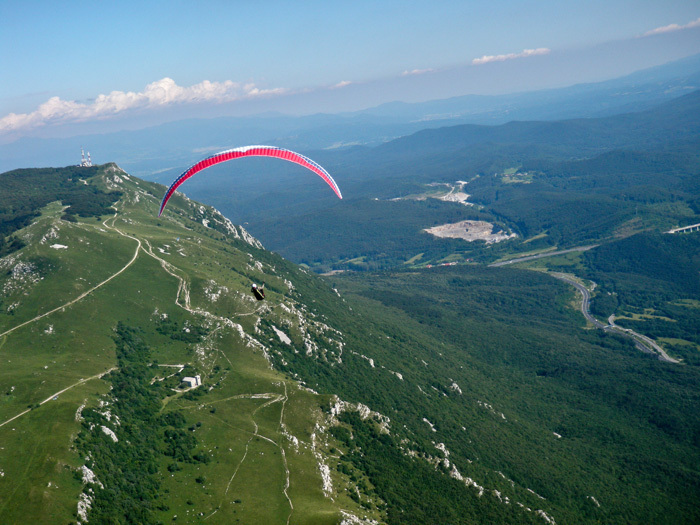 Once all pilots has been collected by our retrieve vans we will drive up to afternoon paragliding sites like Lijak or Kovk which offer great glass-off flights. On average we will spend around four or more hours in the air on each flyable day and cover tens of XC miles flying in spectacular mountain surroundings. 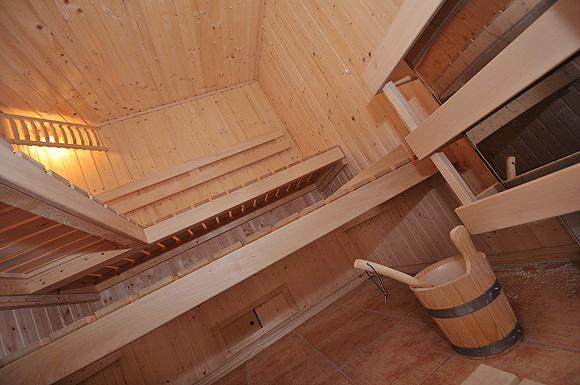 We will stay at a modern and very comfortable guesthouse located in a picturesque village at the Soca valley. 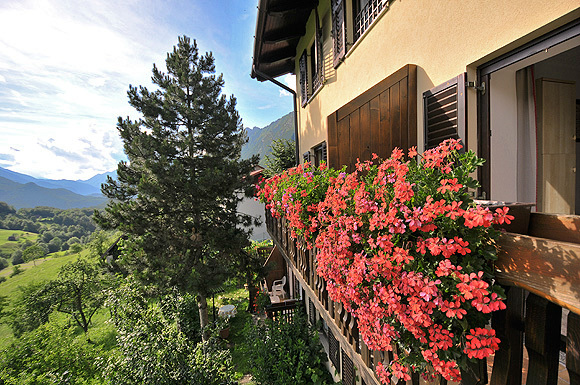 The guesthouse offers nicely furnished rooms with balconies spanning beautiful view towards the river and the valley. All rooms have private bathrooms. There is internet access. 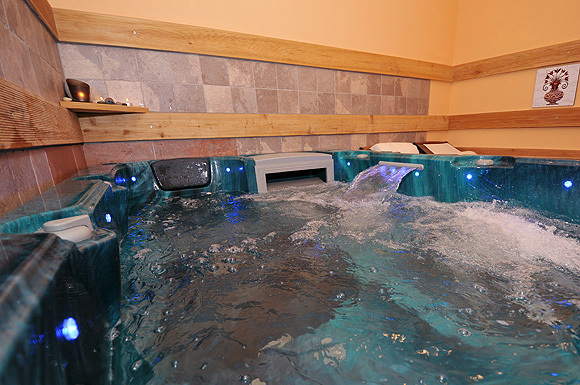 Guest can use a spa pool and a sauna or can relax on a terrace. Every morning a hearty breakfast is served. And on some days the owners serve homemade cheese and yogurt. Home cooked dinner and lunch meals are prepared at the guesthouse's restaurant. If you wish you can rent a bicycle, too. Please see photos of the guesthouse. Did I mention that there is a LZ for paragliders just behind the guesthouse? 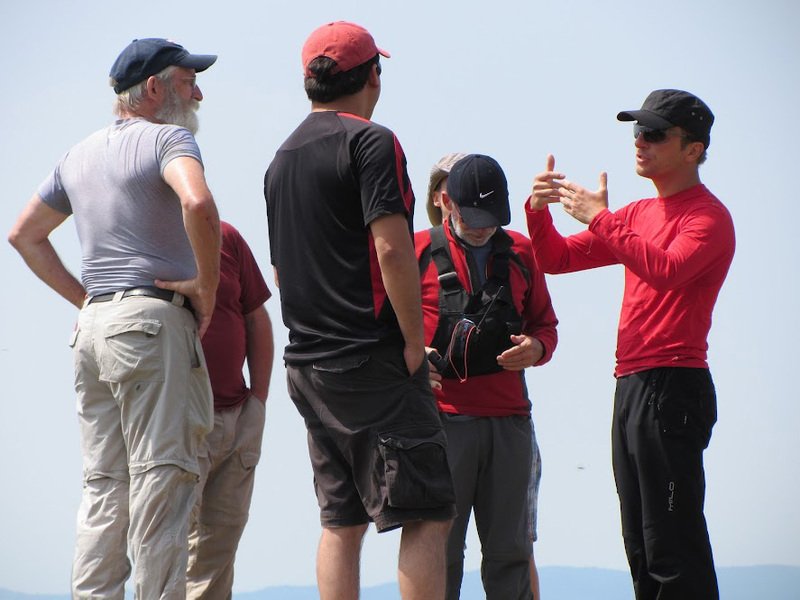 Antofaya Expeditions have years of experience in organizing paragliding trips. We strive to be the best in the business. Our fluent multilingual guides will make your flying vacation totally stress free by taking care of all the practicalities from the moment we pick you up at the Venice airport to the moment we drop you off there ten days later. 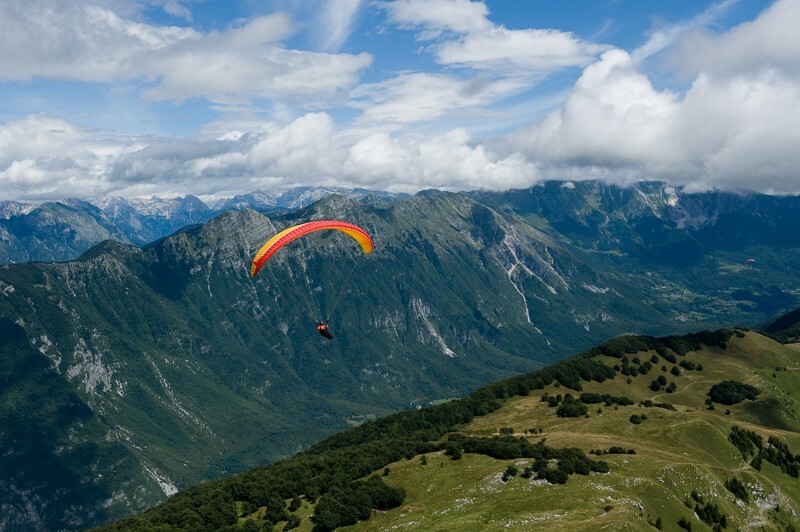 We want you to fully enjoy your paragliding vacations whether it is staying in our modern and comfortable guesthouse or traveling to take-offs in our air conditioned and GPS equipped vans. 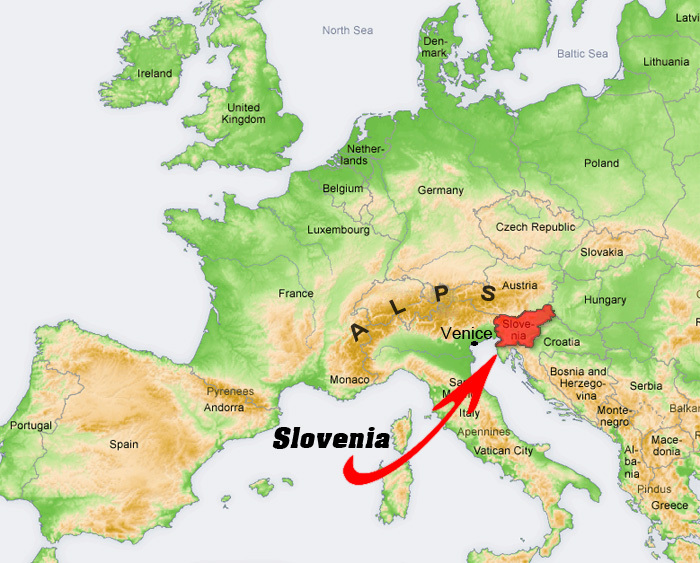 Slovenia is an alpine country and lays in south-central Europe in Julian Alps between Italy, Austria and Croatia, only a couple hours by car from Venice or Vienna. 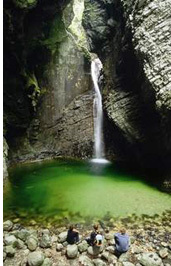 It has Mediterranean climate on the coast and continental climate with mild to hot summers in the mountain valleys. The average temperatures are 75°F (24°C) in July. It is a modern European state with a strong economy and a stable democracy. It is a member of NATO, European Union and eurozone (Euro as a currency). It has the highest per capita GDP in Central Europe. Slovenia has excellent infrastructure with level of health care entirely comparable to other western European countries. 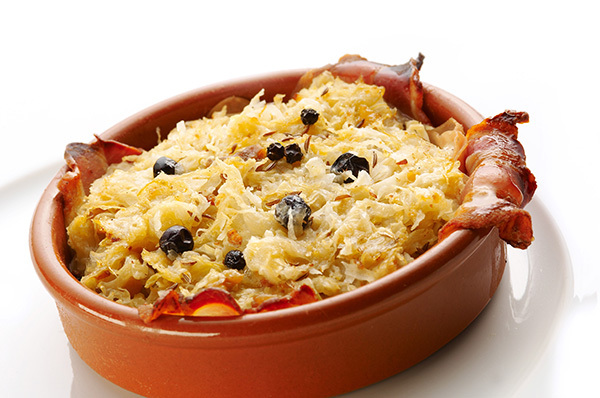 The country is also known for its great wines and delicious traditional food. And if you wish to take a day off from flying there is white water rafting and fly fishing in the emerald river or spectacular limestone caves to visit or medieval port towns on the Mediterranean coast to relax at. • GSM cell phone which allows you send and receive text messages in Europe. 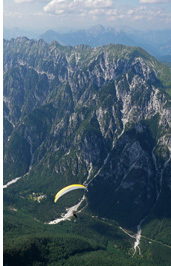 See you flying with us high above the Alps in Slovenia!